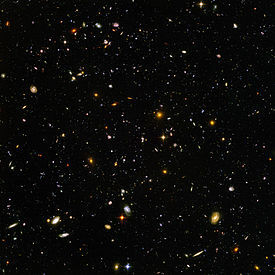 This high-resolution image of the Hubble Ultra Deep Field includes galaxies of various ages, sizes, shapes, and colors. Space exploration is the use of astronomy and space technology to explore outer space. Physical exploration of space is conducted both by human spaceflights and by robotic spacecraft.While the observation of objects in space, known as astronomy, predates reliable recorded history, it was the development of large liquid-fueled rocket engines during the early 20th century that allowed physical space exploration to become a reality. Common rationales for exploring space include advancing scientific research, uniting different nations, ensuring the future survival of humanity and developing military and strategic advantages against other countries. Various criticisms of space exploration are sometimes made, generally on cost or safety grounds. Space exploration has often been used as a proxy competition for geopolitical rivalries such as the Cold War. The early era of space exploration was driven by a "Space Race" between the Soviet Union and the United States ; the launch of the first man-made object to orbit the Earth, the USSR's Sputnik 1, on October 4, 1957, and the first Moon landing by the American Apollo 11 craft on July 20, 1969 are often taken as the boundaries for this initial period. The Soviet space program achieved many of the first milestones, including the first living being in orbit in 1957, the first human spaceflight (Yuri Gagarin aboard Vostok 1) in 1961, the first spacewalk (by Aleksei Leonov) in 1965, the first automatic landing on another celestial body in 1966, and the launch of the first space station (Salyut 1) in 1971. After the first 20 years of exploration, focus shifted from one-off flights to renewable hardware, such as the Space Shuttle program, and from competition to cooperation as with the International Space Station. From the 1990s onwards, private interests began promoting space tourism and then private space exploration of the Moon (see GLXP). In the 2000s, China initiated a successful manned spaceflight program, while Japan and India have also planned future manned space missions. Larger government programs have advocated manned missions to the Moon and possibly Mars sometime after 2010. The first steps into space were taken by German scientists during World War II while testing the V2 rocket which became the first human-made object in space. After the war, the Allies used German scientists and their captured rockets in programs for both military and civilian research. The first scientific exploration from space was the cosmic radiation experiment launched by the U.S. on a V2 rocket on May 10, 1946. The first images of Earth taken from space followed the same year while the first animal experiment saw fruit flies lifted into space in 1947, both also on modified V2s launched by Americans. These suborbital experiments only allowed a very short time in space which limited their usefulness. The first successful orbital launch was of the Soviet unmanned Sputnik mission on October 4, 1957. The satellite weighed about 83 kg (184 pounds), and is believed to have orbited Earth at a height of about 250 km (150 miles). It had two radio transmitters (20 and 40 MHz), which emitted "beeps" that could be heard by radios around the globe. Analysis of the radio signals was used to gather information about the electron density of the ionosphere, while temperature and pressure data was encoded in the duration of radio beeps. The results indicated that the satellite was not punctured by a meteoroid. Sputnik 1 was launched by an R-7 rocket. It burned up upon re-entry on January 3, 1958. The first known successful human spaceflight was Vostok 1 ("East 1"), carrying 27 year old Russian cosmonaut Yuri Gagarin on April 12, 1961. The spacecraft completed one orbit around the globe, lasting about 1 hour and 48 minutes. Gagarin's flight resonated around the world; it was a demonstration of the advanced Soviet space program and it opened an entirely new era in space exploration: human spaceflight. The U.S. first launched a person into space within a month of Vostok 1 with Alan Shepard's suborbital flight in Mercury-Redstone 3. Orbital flight was achieved by the United States when John Glenn's Mercury-Atlas 6 orbited the Earth on February 20, 1962. The first artificial object to reach another celestial body was Luna 2 in 1959. The first automatic landing on another celestial body was performed by Luna 9 in 1966. Luna 10 became the first artificial satellite of another celestial body. The first manned landing on another celestial body was performed by Apollo 11 on July 20, 1969. The first successful interplanetary flyby was the 1962 Mariner 2 flyby of Venus (closest approach 34,773 kilometers). Flybys for the other planets were first achieved in 1965 for Mars by Mariner 4, 1973 for Jupiter by Pioneer 10, 1974 for Mercury by Mariner 10, 1979 for Saturn by Pioneer 11, 1986 for Uranus by Voyager 2, and 1989 for Neptune by Voyager 2. The first interplanetary surface mission to return at least limited surface data from another planet was the 1970 landing of Venera 7 on Venus which returned data to earth for 23 minutes. In 1971 the Mars 3 mission achieved the first soft landing on Mars returning data for almost 20 seconds. Later much longer duration surface missions were achieved, including over 6 years of Mars surface operation by Viking 1 from 1975 to 1982 and over 2 hours of transmission from the surface of Venus by Venera 13 in 1982 (the longest ever Soviet planetary surface mission). The dream of stepping into the outer reaches of the Earth's atmosphere was driven by rocket technology. The German V2 was the first rocket to travel into space, overcoming the problems of thrust and material failure. During the final days of World War II this technology was obtained by both the Americans and Soviets as were its designers. The initial driving force for further development of the technology was a weapons race for intercontinental ballistic missiles (ICBMs) to be used as long-range carriers for fast nuclear weapon delivery, but in 1961 when USSR launched the first man into space, the U.S. declared itself to be in a "Space Race" with Russia. Konstantin Tsiolkovsky, Robert Goddard, Hermann Oberth, and Reinhold Tilling laid the groundwork of rocketry in the early years of the 20th century. Wernher von Braun was the lead rocket engineer for Nazi Germany's World War II V-2 rocket project. In the last days of the war he led a caravan of workers in the German rocket program to the American lines, where they surrendered and were brought to the USA to work on U.S. rocket development. He acquired American citizenship and led the team that developed and launched Explorer 1, the first American satellite. Von Braun later led the team at NASA 's Marshall Space Flight Center which developed the Saturn V moon rocket. Initially the race for space was often led by Sergei Korolyov, whose legacy includes both the R7 and Soyuz—which remain in service to this day. Korolev was the mastermind behind the first satellite, first man (and first woman) in orbit and first spacewalk. Until his death his identity was a closely guarded state secret; not even his mother knew that he was responsible for creating the Russian space program. Valentin Glushko held the role of Chief Engine Designer for USSR. Glushko designed many of the engines used on the early Soviet rockets, but was constantly at odds with Korolyov. Vasily Mishin was Chief Designer working under Sergey Korolyov and one of first Soviets to inspect the captured German V2 design. Following the death of Sergei Korolev, Mishin was held responsible for the Soviet failure to be first country to place a man on the moon. Bob Gilruth was the NASA head of the Space Task Force and director of 25 manned space flights. Gilruth was the person who suggested to John F. Kennedy that the Americans take the bold step of reaching the Moon in an attempt to reclaim space superiority from the Soviets. In the 2000s, several plans for space exploration have been announced; both government entities and the private sector have space exploration objectives. Many private projects have been announced (see list of private spaceflight companies). Among the most notable is Bigelow Aerospace, which has successfully launched and tested two space station modules, Genesis I and Genesis II, and plans to build the first orbital space hotel. The first component of the space hotel, named Sundancer, is scheduled for launch in 2011. The expected cost for a one-week stay on the station is approximately $7.9 million. All of Bigelow's current space habitat designs are based on NASA's Transhab design. The Google Lunar X-Prize also promotes private space exploration by offering a prize of $20 million for the first privately funded company to land a robotic rover on the moon, as well as a $10 million second prize. Companies such as Odyssey Moon and Astrobotic Technology are currently developing robotic landers and rovers for the competition. SpaceX has also performed two successful flights of their Falcon 1 launch vehicle; the first successful fully liquid-propelled orbital launch vehicle developed with private funding and have scheduled their Falcon 9 vehicle for its first launch in late 2009. Richard Branson's Virgin Group and Scaled Composites have announced taking human space tourists into space with SpaceShipTwo, a reusable, sub-orbital spaceplane, to be unveiled in December, 2009, and begin public flights in 2010 (see Virgin Galactic). SpaceShipTwo will be able to transport eight humans (two pilots and six passengers) into space at a time. A ticket on SpaceShipTwo currently costs $200,000, but the price is expected to drop to $20,000 over time. While the Sun will probably not be physically explored in the close future, one of the reasons for going into space includes knowing more about the Sun. Once above the atmosphere in particular and the Earth's magnetic field, this gives access to the Solar wind and infrared and ultraviolet radiations that cannot reach the surface of the Earth. The Sun generates most space weather, which can affect power generation and transmission systems on Earth and interfere with, and even damage, satellites and space probes. Mercury remains the least explored of the inner planets. As of January 2008, the Mariner 10 and MESSENGER missions have been the only missions that have made close observations of Mercury. MESSENGER made a fly-by of Mercury on 14 January 2008, to further investigate the observations made by Mariner 10 in 1975 (Munsell, 2006b). A third mission to Mercury, scheduled to arrive in 2020, BepiColombo is to include two probes. BepiColombo is a joint mission between Japan and the European Space Agency . MESSENGER and BepiColombo are intended to gather complementary data to help scientists understand many of the mysteries discovered by Mariner 10's flybys. Venus was the first target of interplanetary flyby and lander missions and, despite one of the most hostile surface environments in the solar system, has had more landers sent to it (nearly all from the Soviet Union) than any other planet in the solar system. The first successful Venus flyby was the American Mariner 2 spacecraft, which flew past Venus in 1962. Mariner 2 has been followed by several other flybys by multiple space agencies often as part of missions using a Venus flyby to provide a gravitational assist en route to other celestial bodies. In 1967 Venera 4 became the first probe to enter and directly examine the atmosphere of Venus. In 1970 Venera 7 became the first successful lander to reach the surface of Venus and by 1985 it had been followed by eight additional successful Soviet Venus landers which provided images and other direct surface data. Starting in 1975 with the Soviet orbiter Venera 9 some ten successful orbiter missions have been sent to Venus, including later missions which were able to map the surface of Venus using radar to pierce the obscuring atmosphere. Space exploration has been used as a tool to understand the Earth as a celestial object in its own right. Orbital missions can provide data for the Earth that can be difficult or impossible to obtain from a purely ground-based point of reference. For example, the existence of the Van Allen belts was unknown until their discovery by the United States' first artificial satellite, Explorer 1. These belts contain radiation trapped by the Earth's magnetic fields, which currently renders construction of habitable space stations above 1000 km impractical.Following this early unexpected discovery, a large number of Earth observation satellites have been deployed specifically to explore the Earth from a space based perspective. These satellites have significantly contributed to the understanding of a variety of earth based phenomena. For instance, the hole in the ozone layer was found by an artificial satellite that was exploring Earth's atmosphere, and satellites have allowed for the discovery of archeological sites or geological formations that were difficult or impossible to otherwise identify. Earth's Moon was the first celestial object (apart from the Earth itself) to be the object of space exploration. It holds the distinctions of being the first remote celestial object to be flown by, orbited, and landed upon by spacecraft, and the only remote celestial object ever to be visited by humans. In 1959 the Soviets obtained the first images of the far side of the Moon, never previously visible to humans. The U.S. exploration of the Moon began with the Ranger 4 impactor in 1962. Starting in 1966 the Soviets successfully deployed a number of landers to the Moon which were able to obtain data directly from the Moon's surface; just four months later, Surveyor 1 marked the debut of a successful series of U.S. landers. The Soviet unmanned missions culminated in the Lunokhod program in the early '70s which included the first unmanned rovers and also successfully returned lunar soil samples to the Earth for study. This marked the first (and to date the only) automated return of extraterrestrial soil samples to the Earth. Unmanned exploration of the Moon continues with various nations periodically deploying lunar orbiters, and in 2008 the Indian Moon Impact Probe. Manned exploration of the Moon began in 1968 with the Apollo 8 mission that successfully orbited the Moon, the first time any extraterrestrial object was orbited by humans. In 1969 the Apollo 11 mission marked the first time humans set foot upon another world. Manned exploration of the Moon did not continue for long, however. The Apollo 17 mission in 1972 marked the last time humans would visit the Moon in any form and no human exploration mission is planned to reach the Moon sooner than the 2010s. The exploration of Mars has been an important part of the space exploration programs of the Soviet Union (later Russia), the United States, Europe, and Japan. Dozens of robotic spacecraft, including orbiters, lander, and rover, have been launched toward Mars since the 1960s. These missions were aimed at gathering data about current conditions and answering questions about the history of Mars. The questions raised by the scientific community are expected to not only give a better appreciation of the red planet but also yield further insight into the past, and possible future, of Earth. The exploration of Mars has come at a considerable financial cost with roughly two-thirds of all spacecraft destined for Mars failing before completing their missions, with some failing before they even began. Such a high failure rate can be attributed to the complexity and large number of variables involved in an interplanetary journey, and has led researchers to jokingly speak of The Great Galactic Ghoul which subsists on a diet of Mars probes. This phenomenon is also informally known as the Mars Curse. The Russian space mission Phobos-Grunt, Scheduled to launch in 2011, will begin exploration of Phobos and Martian circumterrestrial orbit, and study whether the moons of Mars, or at least Phobos, could be a "trans-shipment point" for spaceships travelling to Mars. The exploration of Jupiter has consisted solely of a number of automated NASA spacecraft visiting the planet since 1973. A large majority of the missions have been "flybys", in which detailed observations are taken without the probe landing or entering orbit; the Galileo spacecraft is the only one to have orbited the planet. As Jupiter is believed to have only a relatively small rocky core and no real solid surface, a landing mission is nearly impossible. Reaching Jupiter from Earth requires a delta-v of 9.2 km/s, which is comparable to the 9.7 km/s delta-v needed to reach low Earth orbit. Fortunately, gravity assists through planetary flyby can be used to reduce the energy required at launch to reach Jupiter, albeit at the cost of a significantly longer flight duration. Jupiter has over 60 known moons, many of which have relatively little known about them. Saturn has been explored only through unmanned spacecraft launched by NASA, including one mission (Cassini–Huygens) planned and executed in cooperation with other space agencies. These missions consist of flybys in 1979 by Pioneer 11, in 1980 by Voyager 1, in 1982 by Voyager 2 and an orbital mission by the Cassini spacecraft which entered orbit in 2004 and is expected to continue its mission well into 2010. Saturn has at least 60 satellites, although the exact number is debatable since Saturn's rings are made up of vast numbers of independently orbiting objects of varying sizes. The largest of the moons is Titan. Titan holds the distinction of being the only moon in the solar system with an atmosphere denser and thicker than that of the Earth. As a result of the deployment from the Cassini spacecraft of the Huygens probe and its successful landing on Titan, Titan also holds the distinction of being the only moon (apart from Earth's own Moon) to be successfully explored with a lander. The exploration of Uranus has been entirely through the Voyager 2 spacecraft, with no other visits currently planned. Given its axial tilt of 97.77°, with its polar regions exposed to sunlight or darkness for long periods, scientists were not sure what to expect at Uranus. The closest approach to Uranus occurred on January 24, 1986. Voyager 2 studied the planet's unique atmosphere and magnetosphere. Voyager 2 also examined its ring system and the moons of Uranus including all five of the previously known moons, while discovering an additional ten previously unknown moons. Images of Uranus proved to have a very uniform appearance, with no evidence of the dramatic storms or atmospheric banding evident on Jupiter and Saturn. Great effort was required to even identify a few clouds in the images of the planet. The magnetosphere of Uranus, however, proved to be completely unique and proved to be profoundly affected by the planet's unusual axial tilt. In contrast to the bland appearance of Uranus itself, striking images were obtained of the moons of Uranus, including evidence that Miranda had been unusually geologically active. The exploration of Neptune began with the August 25, 1989 Voyager 2 flyby, the sole visit to the system as of 2009. The possibility of a Neptune Orbiter has been discussed, but no other missions have been given serious thought. Although the extremely uniform appearance of Uranus during Voyager 2's visit in 1986 had led to expectations that Neptune would also have few visible atmospheric phenomena, Voyager 2 found that Neptune had obvious banding, visible clouds, auroras, and even a conspicuous anticyclone storm system rivaled in size only by Jupiter's Great Spot. Neptune also proved to have the fastest winds of any planet in the solar system, measured as high as 2,100 km/h. Voyager 2 also examined Neptune's ring and moon system. It discovered four complete rings and additional partial ring "arcs" around Neptune. In addition to examining Neptune's three previously known moons, Voyager 2 also discovered five previously unknown moons, one of which, Proteus, proved to be the second largest moon in the system. Data from Voyager further reinforced the view that Neptune's largest moon, Triton, is a captured Kuiper belt object. Pluto continues to be of great interest, despite its reclassification as the lead and nearest member of a new and growing class of distant icy bodies of intermediate size, in mass between the remaining eight planets and the small rocky objects historically termed asteroids (and also the first member of the important subclass, defined by orbit and known as "Plutinos"). After an intense political battle, a mission to Pluto dubbed New Horizons was granted funding from the US government in 2003. New Horizons was launched successfully on January 19, 2006. In early 2007 the craft made use of a gravity assist from Jupiter. Its closest approach to Pluto will be on July 14, 2015; scientific observations of Pluto will begin five months prior to closest approach and will continue for at least a month after the encounter. Ceres is relatively ill explored at present, but in 2015 Nasa's Dawn space probe is expected to arrive at and enter into orbit around the dwarf planet. Until the advent of space travel, objects in the asteroid belt were merely pinpricks of light in even the largest telescopes, their shapes and terrain remaining a mystery.Several asteroids have now been visited by probes, the first of which was Galileo, which flew past two: 951 Gaspra in 1991, followed by 243 Ida in 1993. Both of these lay near enough to Galileo's planned trajectory to Jupiter that they could be visited at acceptable cost. The first landing on an asteroid was performed by the NEAR Shoemaker probe in 2000, following an orbital survey of the object. The dwarf planet Ceres and the asteroid 4 Vesta, two of the three largest asteroids, are targets of NASA's Dawn mission, launched in 2007 September. The research that is conducted by national space exploration agencies, such as NASA and the RKA, is one of the reasons supporters cite to justify government expenses. Some even claim that space exploration is a necessity to mankind and that staying on our home planet will lead us to extinction. Some of the reasons are lack of natural resources, comets, nuclear war, and worldwide epidemic. Stephen Hawking, renowned British theoretical physicist, said that "I don't think the human race will survive the next thousand years, unless we spread into space. There are too many accidents that can befall life on a single planet. But I'm an optimist. We will reach out to the stars." Arthur C. Clarke (1950) presented a summary of motivations for the human exploration of space in his non-fiction semi-technical monograph Interplanetary Flight. He argued that humanity's choice is essentially between expansion off the Earth into space, versus cultural (and eventually biological) stagnation and death. Critics such as the late physicist and Nobel prize winner Richard Feynman have contended that human space travel (as distinguished from space exploration in general, such as robotic missions) has never achieved any major scientific breakthroughs. Spaceflight is the use of space technology to fly a spacecraft into and through outer space. Spaceflight is typically a component of space exploration, but also supports commercial activities, satellite launches. To date, the longest human occupation of space was the space station Mir, which was continuously inhabited for almost ten years, including Valeri Polyakov's record single spaceflight of almost 438 days. Long-term stays in space reveal issues with bone and muscle loss in low gravity, immune system suppression, and radiation exposure. Betty Blair (1995), "Behind Soviet Aeronauts", Azerbaijan International 3 (3). iTWire - Scientists will look for alien life, but Where and How? IAU 2006 General Assembly: Result of the IAU Resolution votes. International Astronomical Union (2006) .